Irvine, California September 6, 2010 Expert author and public speaker, Anne Bruce joins the Speaking of Wealth Show™ on episode two for an interview with Jason Hartman. 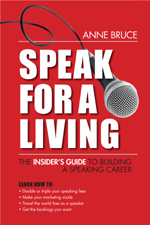 Bruce’s recent book, Speak for a Living is the focal point of the episode, while Hartman draws questions pertaining to her expertise as a speaker. Although most speakers are viewed as mostly independent , Bruce acknowledges that speakers can be a part of an organization and still be very successful. According to Bruce, a speaker ought to be a thought leader, not just someone with a well-known name, but they must also articulate the message in an entertaining way in order to be a successful speaker. Not only does a beginning public speaker need to have thick skin, they must also be entertaining, able to capture an audience’s attention and most of all, should be in physical shape to consistently participate in regular speaking engagements. Anne Bruce is an author of 14 books and has spoke at organizations such as JetBlue, Coca-Cola, GEICO, Best Buy and many others. Bruce is also currently working on her 15th book during the time of this episode. In today’s world, it’s quickly becoming a place where you can no longer depend on employers or government to look after you. And whether you are a professional speaker, publisher, or author, the Speaking of Wealth Show offers free educational information to help maximize your knowledge and skills to ensure your success. The Speaking of Wealth Show can be found on http://www.speakingofwealth.com/category/podcast/ or the iTunes store.